WHO LIES : About Arming Iraq? Secretary of Defense Donald Rumsfeld has denied any knowledge of US shipments of biological specimens to Iraq during the 1980’s. At a September 2002 Armed Services Committee hearing, Rumsfeld resonded to questions about such shipments by saying that he had no knowledge of any such shipments and doubted that they ever occurred. At a March, 2003 BBC interview, when again asked about weapons inputs, he said, "I don't know where you get your information, and I don't believe it's correct." In 1994, the Senate Committee Banking, Housing and Urban Affairs established that the US had shipped a variety of toxic specimens to Iraq between January 1980 and October 1993. The Centers for Disease Control and U.S. Commerce Department provided lists of these shipments, which included Bacillus Anthracis, (anthrax) Clostridium botulinum, and West Nile Fever Virus. 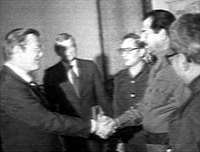 In December 1983, as the UN first reported Iraqi use of chemical weapons, Rumsfeld was in Baghdad, telling Saddam that the US was looking forward to closer ties with Iraq. In his September 2002 Armed Services Committee hearing, Rumsfeld told Sen. Robert Byrd that he had gone to Iraq as a "private citizen" concerned with the situation in Lebanon. The State Department's talking-points memo for Rumsfeld's meeting with Saddam asked him to note that the US "would regard any major reversal of Iraq’s fortunes as strategic defeat for the West." Howard Teicher, a National Security Council aide who accompanied Rumsfeld to Baghdad, said in sworn court testimony that on his trip, Rumsfeld had relayed then Israeli PM Yitzhak Shamir's offer to help Iraq in its war with Iran. 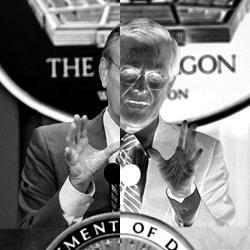 In a CNN interview in September 2002, Rumsfeld said that he had "cautioned" Hussein about the use of chemical weapons. This claim is at odds with declassified State Department notes of his meeting with Saddam. A Pentagon spokesman, Brian Whitman, later claimed that Rumsfeld raised the issue not with Hussein, but with Iraqi foreign minister, Tariq Aziz. The State Department notes show that he mentioned chemical weapons in passing as one of several matters that "inhibited" US efforts to assist Iraq. Rumsfeld also said he had "nothing to do" with helping Iraq in its war against Iran. In his March 2003 interview with the BBC, he said that he did not know if Iraq had been taken off the list of terrorist states pursuant to his visit. State Department documents show that Rumsfeld's visits to Baghdad contributed to closer US-Iraqi ties. The US was eager to resume diplomatic relations, and Reagan removed Iraq from the State Department terrorism list in February, 1982. In 1988, Rumsfeld cited his ability to make friends with Saddam Hussein as one of his qualifications for a possible run at the presidency.